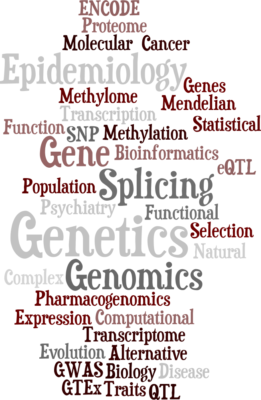 Dr Eric R. Gamazon and his team of collaborators develop and apply genomic and computational methods to investigate the genetic architecture of complex traits, including disease risk and drug response. He is interested in what can be learned from DNA sequence and multi-omics data about disease mechanism, therapeutic intervention, molecular evolution, and genome function. An ongoing project involves understanding the effect of genetic variation on gene regulation to gain insights into disease mechanisms and therapeutic targets. He utilizes large-scale DNA biobank data linked to electronic health records to identify genes involved in human health and disease, to discover novel biomarkers, and to enable a comprehensive systems view of the disease phenome. In recent highly interdisciplinary work, he is developing computational approaches to studying the structure, dynamics, and stability of biological molecules within Density Functional Theory (DFT), molecular dynamics, and coarse-grained modelling and using experimental data (e.g., from X-ray crystallography or NMR spectroscopy). Current research interests in complex traits genetics include characterizing the genetic architecture of hematopoietic diseases, including Myelodysplastic Syndromes (MDS) and Acute Myeloid Leukemia (AML). He is generating functional genomics resources for probing molecular mechanisms underlying hematopoiesis and hematologic disorders with collaborator Dr. Sandra Zinkel. Ongoing research includes modeling the transcriptional regulatory programs in the brain, in collaboration with human geneticists, neuroscientists, and evolutionary biologists. This work has obvious relevance to understanding the molecular basis of neuropsychiatric and neurodegenerative disorders. Here is a list of select publications and the latest news. He is part of the GTEx Consortium and the T2D-GENES Consortium. He was also a member of the International Warfarin Pharmacogenetics Consortium GWAS team. He is a member of the faculty in the Division of Genetic Medicine in the Department of Medicine, the Vanderbilt Genetics Institute, and the Vanderbilt Data Science Institute. In 2018, he was elected to a Clare Hall Visiting Fellowship to advance his research and scholarship and mentor graduate students in the University of Cambridge. Fellows become Life Members of Clare Hall, Cambridge and are welcomed back any time to participate in the intellectual life of the college. He is also a visiting scholar in the Department of Medicine, the MRC Epidemiology Unit, and the MRC Biostatistics Unit of the University of Cambridge. He conducted research in genomics and translational science in the Section of Genetic Medicine of the University of Chicago and the Faculty of Medicine (AMC) of the University of Amsterdam.